Phyllis Zee, MD, PhD, ’87 ’89 GME, the Benjamin and Virginia Boshes Professor of Neurology and chief of Sleep Medicine, was senior author of the study that used gentle noise stimulation to boost cardiovascular health. Gentle sound stimulation during sleep improved cardiac function in patients, according to a new Northwestern Medicine study published in the journal Sleep. 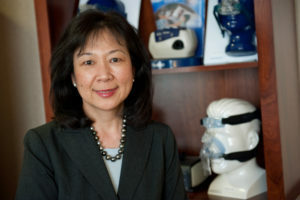 This is the first evidence that enhancing sleep can boost the autonomic nervous system, which controls things like heart rate, digestion and breathing, according to Phyllis Zee, MD, PhD, ’87 ’89 GME, the Benjamin and Virginia Boshes Professor of Neurology and chief of Sleep Medicine, was senior author of the study. Daniela Grimaldi, MD, PhD, research assistant professor in the Ken & Ruth Davee Department of Neurology, in the Division of Sleep Medicine, and Penelope Papalambros, a seventh-year student in Northwestern University’s Interdepartmental Neuroscience PhD Program, were co-first authors of the study. Slow-wave sleep is the deepest phase of sleep, where the brain recovers from its daily activities. The Northwestern team has previously shown acoustic enhancement of slow-wave sleep improved memory consolidation, but the effects on the autonomic nervous system have gone unstudied thus far. Grimaldi, Papalombros and other colleagues gave 20 healthy participants one night of acoustic stimulation and one night of placebo stimulation, where individuals followed the same procedures but did not hear any noise. “The acoustic stimulation reads an individual’s brain waves in real time and precisely delivers a short burst of pink noise to help synchronize communication of neurons in deep sleep,” said Zee, who is also director of the Center for Circadian and Sleep Medicine and a professor of Neurology in the Division of Sleep Medicine. After stimulation, the scientists found patients had a higher degree of heart rate variability, which measures the beat-to-beat alterations in heart rate. Higher heart rate variability indicates better ability to shift between a relaxed state and the “fight or flight” response, and is associated with resilience to stress, according to previous studies. In addition, patients receiving stimulation had a reduction in plasma cortisol levels the following morning. This is significant because heart rate variability and plasma cortisol levels are controlled by different halves of the autonomic nervous system — the parasympathetic and sympathetic systems, respectively — and the acoustic enhancement improved both. Interestingly, slow-wave sleep appears to operate in a feedback loop with the autonomic system, according to Grimaldi. “In this sense, our findings suggest that acoustic stimulation during sleep strengthens the natural interaction between the two systems,” Grimaldi said. Further, since the autonomic nervous system is the path through which sleep affects many other functions throughout the body, Grimaldi believes that other physiological functions may be improved after acoustic stimulation. “Approaches which are able to manipulate sleep, in particular slow-wave activity, have the potential to improve overall physiological homeostasis,” Grimaldi said. However, future studies are needed to confirm these findings and verify their effect on overall health — especially in older adults and clinical populations who would benefit from this noninvasive therapy, but whose autonomic systems are often impaired by age and other diseases. Regardless, these findings light a clear path forward for future research of neural stimulation to improve autonomic function, according to Zee. “It really speaks to the power of sleep for brain and body health,” Zee said. Other co-authors include Kathryn Reid, PhD, research professor of Neurology in the Division of Sleep Medicine; Sabra Abbott, MD, PhD, and Roneil Malkani, MD, both assistant professors of Neurology in the Division of Sleep Medicine; Maged Gendy, research staff; Marta Iwanaszko, a postdoctoral fellow and Rosemary Braun, PhD, MPH, assistant professor of Preventive Medicine in the Division of Biostatistics. This work was supported by Defense Advanced Research Projects Agency award W911NF-16- 2-0021 and the Northwestern University Feinberg School of Medicine Center for Circadian and Sleep Medicine.